When World Peace Day was celebrated on September 21, it was marked by demonstrations around the world. Everywhere, people challenged governments and elites to think creatively about solving conflicts peacefully. But the toughest job probably fell to the young Congolese men and women, going to the streets of Goma, in eastern Democratic Republic of Congo (DRC). They demanded an end to the violence that has shaken the country for two decades and a transformation of the political system driving this violence. To appreciate the courage of these demonstrators and to get a sense of what they are up against, one needs to have some background on the recent history of their country. Under colonial rule, the DRC was the personal fiefdom of Leopold II, King of Belgium. Almost 75 times larger than its occupier, the Congo was mercilessly exploited and the Belgians won the questionable honor of introducing to central Africa the punishment of cutting of hands and feet of forced laborers. Things didn’t turn any brighter after independence, with the iconic (if naive) democratically elected leader Patrice Lumumba being murdered in a conspiracy involving internal enemies, the former colonizers and the CIA. Colonel Mobuto Sese Seko emerged as absolute ruler from the ashes of Congo’s young democracy and — after thoughtfully aligning himself with Western powers against the Soviet Union — was left alone to treat a country the size of western Europe as his personal bank account for the next three decades. Since 1994, when the fallout from the Rwandan genocide inspired seven African countries to send their armies to slug it out on Congolese soil, eastern Congo has not known anything approaching the concept of “peace” as we know it. More than five million people died as a consequence and agents of the state — the police and army included — have proved to be just as predatory as members of any of the other violent political groups competing for power. While resignation and indifference is certainly not helping the cause, it is actually one of the more harmless reactions towards the actions of the group. When the CPN organized a sit-in in front of a hotel in Goma on August 15, where military commanders from around the region were talking about yet another intervention, several of its members were taken into custody by the military secret service. On World Peace Day, six activists were imprisoned and two demonstrators were injured, when members of the security forces fired live rounds at the march, according to Patrick. The CPN draws much of its ideological inspiration from two towering figures of nonviolent resistance: Martin Luther King Jr. and Mahatma Gandhi. Patrice Lumumba and Nelson Mandela are also cited as role models, but they “try to analyze their mistakes,” says Patrick, which may be sensible, given that Lumumba wasn’t able to build critical support for his ideas. Thanks for this excellent and important article about a relatively new organization. One of the heartening things about the Congo is that, contrary to popular misconceptions, there are many organizations in civil society throughout the country which are committed to nonviolence, peace and justice. 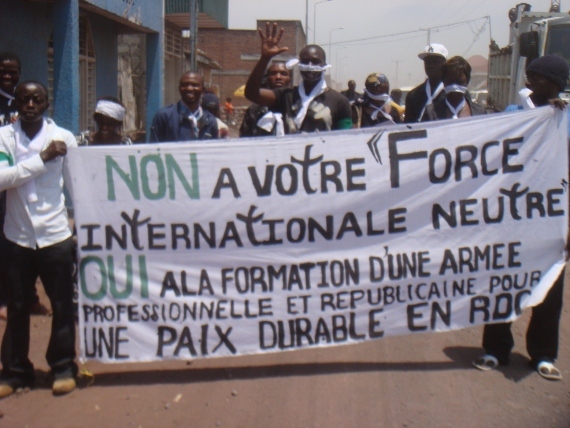 It is also heartening to know that the Congo Peace Network has a web presence so that those interested in more information, or in providing direct support and solidarity, can do so. CPN can be found at http://www.congopeacenetwork.org/Contacts.html, and on FaceBook at: http://www.facebook.com/CpNetwork.